(2015). Chitosan/nanosilver Nanofiber Composites with Enhanced Morphology and Microbiological Properties. Journal of Textiles and Polymers, 3(2), 64-70.
. "Chitosan/nanosilver Nanofiber Composites with Enhanced Morphology and Microbiological Properties". Journal of Textiles and Polymers, 3, 2, 2015, 64-70. (2015). 'Chitosan/nanosilver Nanofiber Composites with Enhanced Morphology and Microbiological Properties', Journal of Textiles and Polymers, 3(2), pp. 64-70. Chitosan/nanosilver Nanofiber Composites with Enhanced Morphology and Microbiological Properties. 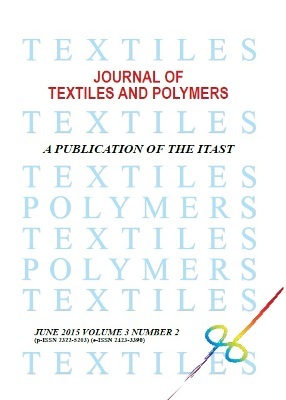 Journal of Textiles and Polymers, 2015; 3(2): 64-70. In recent years natural polymers have been widely used in biomedical applications. Application of natural and biocompatible polymers in wound dressing, medical sutures and tissue engineering are extensively growing. Additional properties are provided when metal nanoparticles such as silver and gold are incorporated in to the fibers. However, nowadays nanofibers due to their inherent properties such as higher surface to area with these nanoparticles are used for biomedical application. In this study chitosan has been converted into nanofibers and the effect of silver nanoparticle on the antibacterial properties of the nanocomposite fibers has been investigated. Chitosan (Cs)/poly (vinyl alcohol) (PVA) solutions in 2% (v/v) aqueous acetic acid were electrospun. The effects of different total concentrations of polymer solutions and mass ratios of Cs and PVA on the fibers formation and its morphology have been investigated by SEM. Effect of spinning parameters on the nanofiber diameter have been investigated. Fine nanofibers, without bead were obtained from 8% total concentration of polymer in aqueous acetic acid solution and 40/60 mass ratio of Cs/PVA. To improve the antibacterial properties of nanofibers silver was incorporated in to the electrospinning solution by two different ways ie., i) addition of silver nanoparticles into the electrospinning solution and ii) addition of silver nitrate salt and then reducing it to silver. Antibacterial activity of nanofibers against St.aureus as gram-positive and P.aeruginosa as gram-negative bacteria shows that nanofibers containing silver nanoparticles have stronger antibacterial activity than nanofibers without silver. Moreover, cell culture test shows that cells can grow easily on these nanofibrous webs.